Fashion Faux Pas: How is The World's 2nd Dirtiest Industry not a Topic at Climate Week? Imagine going to an Italian restaurant and not seeing pasta on the menu. Or going to a parent-teacher conference to learn that math and science aren't part of your child's curriculum. Or signing up for a healthcare plan and discovering that none of your prescriptions are covered. Welcome to Climate Week. With over 90 different sanctioned events throughout New York City, there is a gaping hole in the critical discussions taking place. 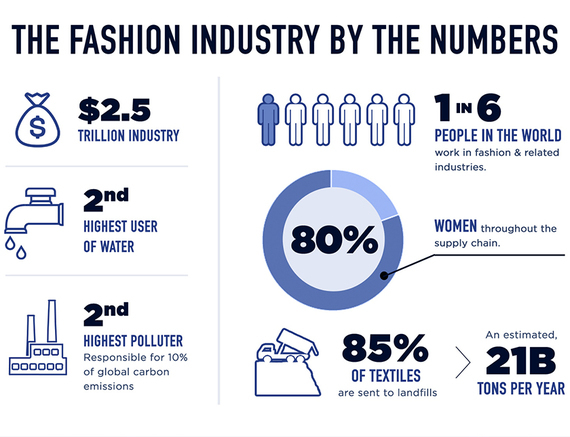 Climate Week has failed to address the world's second dirtiest industry: fashion. Over the past 8 years since Climate Week was set in motion, fashion has barely registered, taking a back seat to finance, food, even faith. It's as if the whole industry is still recovering from fashion week. Important conversations on the future of green tech, impact investing, and smart cities are all ongoing while fashion sleeps off its hangover and silence emanates on the role it can play in igniting its potential to help solve climate changes. Given its size and scope, environmental transformation of the fashion industry is the most under-reported and under-valued piece in achieving the UN's climate change objectives. While fashion is currently the world's second dirtiest industry as measured by the effects of its pesticide usage, toxic dye runoff into waterways, the sheer volume of waste (both manufacturing waste and post-consumer waste), and destructive water and land usage among other factors, accelerating the potential of fashion as a force for good could solve many of the environmental challenges being discussed this week while at the same time make the importance of climate change relatable to millions of consumers. 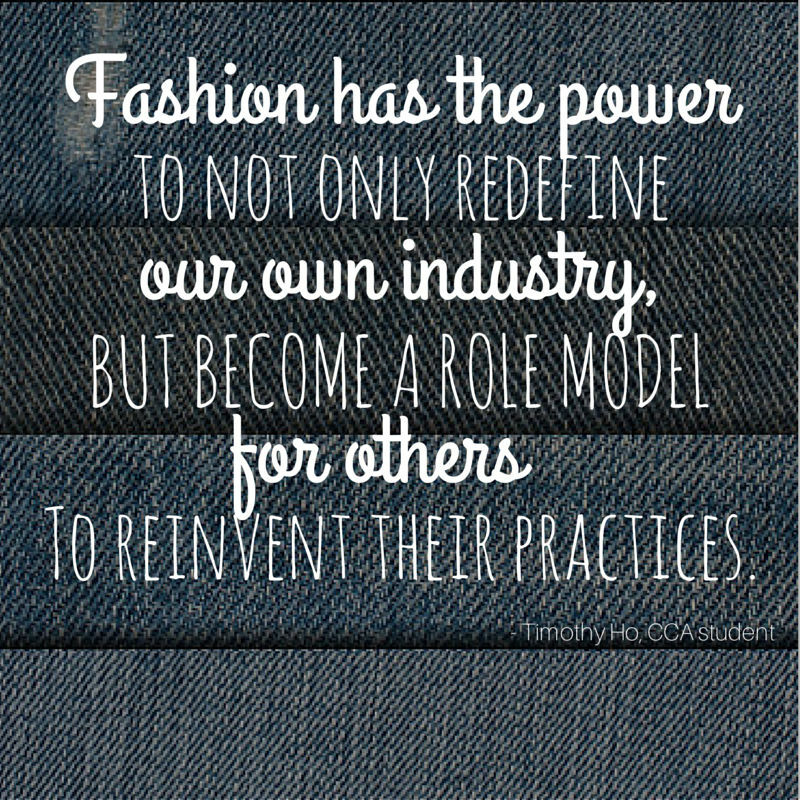 Fashion is uniquely positioned to unleash enormous social and environmental good. It is the only global industry that could affect change for almost all of the UN Millenial Development Goals including reducing waste and pollution, protecting lands and cultures, empowering women, ending slavery, promoting fair labor, and restoring biodiversity in our fields and waterways. Currently, cotton, chiefly grown for fashion, uses 22.5% of the world's insecticides and 10% of all pesticides, while only accounting for 2.5% of agricultural land. The majority of these pesticides are laced with harmful toxins and cancer causing carcinogens. Within 20 years, the biodiversity of the sprayed fields are wiped out. Rivers and water sources surrounding cotton fields are often too toxic to drink from. Humans too, are affected. Between 25 to 77 million agricultural workers worldwide suffer from acute pesticide poisoning. Organic cotton only accounts for less than 2% of global cotton production. Increasing that number even 5x would go a long way toward saving the earth and its people by protecting huge swaths of land and water biodiversity. So too would decreasing the amount of toxic dyes in our clothing. As many as 8000 synthetic dyes, hundreds that are toxichttps://www.theguardian.com/sustainable-business/dyeing-textile-sector-water-risks-adidas, are known to be used in fashion production resulting in 17 to 20% of industrial water pollution worldwide. According to the UN, water pollution and water scarity are the two biggest impediments towards defeating extreme global poverty. Facts like that make the 1,800 gallons of water used to make a pair of jeans seem almost criminal. Fortunately, companies have taken significant steps to address pollution and water usage. Levi's has developed "water-less" demin production (a process that has been adopted by other denim brands) saving tens of millions of gallons of water per year. Companies like Color Zen are developing new ways to dye fabrics with minimum to no environmental footprint. Vegetable dyestuffs are now increasingly gaining market share. 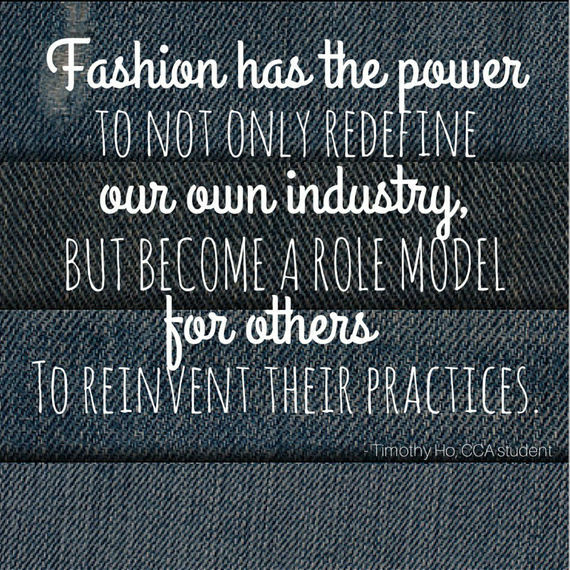 Nevertheless, progress will be limited unless we tackle fast fashion and its insatiable marketing of consumerism that fuels the 1.2 trillion dollar a year clothing industry. In 1950, 98% of Americans clothing was made in the U.S.A. Today, that number has been flipped. Only 2% is made here. Meanwhile, adjusted for inflation, the price of your average t-shirt and jeans has dropped almost 8x in that same time frame. It's no wonder that when the shirt at an H&M in Soho is the same price as a burger down the street, we as a society no longer value the integrity of our clothes. This has led to a throw-away culture that acquiesced to Americans tossing 10.5 million tons of clothing a year into landfills (which accounts for 8% of all landfill waste). Companies like Bionic yarn, which has created a stronger thread made from plastic water bottles, and Recover, which is able to recycle cotton, offer hope. 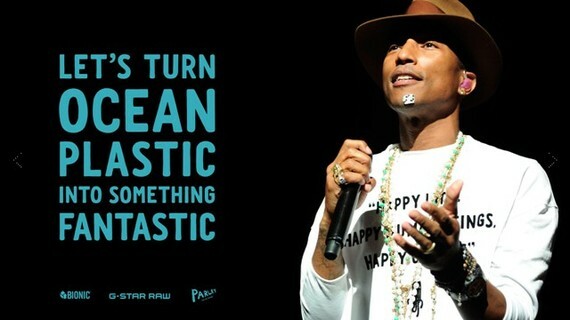 So too does the rise of the slow fashion movement. As long as fashion is not included in climate discussions, change can not fully occur. Until the industry and climate activists alike demand action, fashion's potential as a force for good will be spun as a tale of regret.